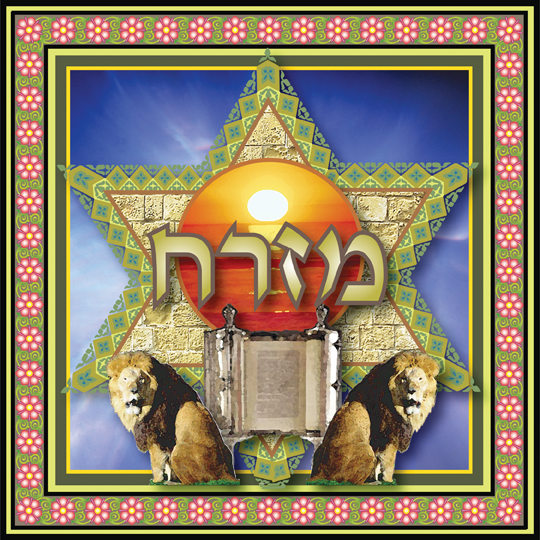 Traditionally, a Mizrach (מזרח), meaning "East", defines a decorated sign hung on the walls of the home or synagogue to indicate the preferred direction or orientation for prayer, i.e. facing east toward Jerusalem. It is said that the resting place for “Shechina HaShem’s” or “G-d’s Presence is towards the East. In this art piece, a border of vine-entangled flowers surrounds an ethereal blue sky, a reminder of our Creator and the realm of heaven. Floating above this sky is an ornate Mogen David (Star of David). Within the star are Jerusalem stones reminiscent of the Western Wall, the final remnants of the Jewish Holy Temple. 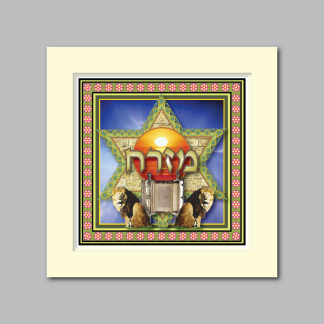 A circle in the heart of the Mogen David depicts a golden sun as it sets in the east. 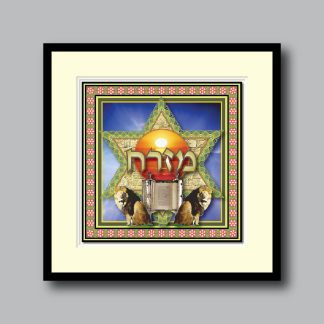 Below, two majestic lions flank and guard a beautiful shimmering Torah scroll, the source of wisdom and sacred learning for all Jewish people.